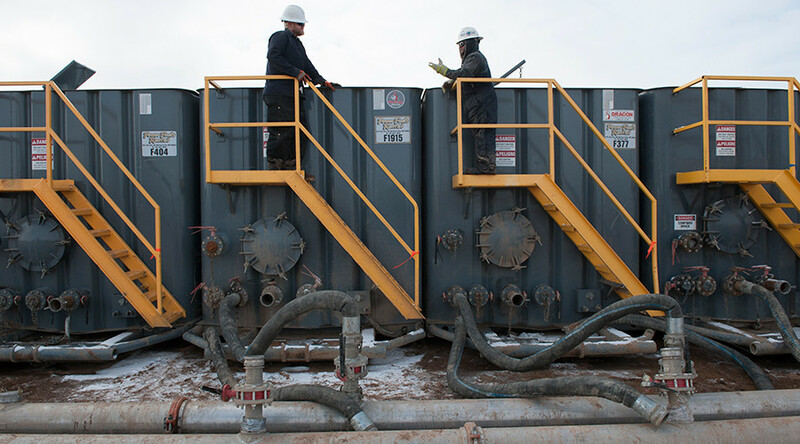 A Stanford University study shows that fracking can pollute underground drinking water. Using publicly available data and reports, researchers found organic compounds used in hydraulic fracturing were migrating into groundwater from unlined pits. "This is a wake-up call," said lead author Dominic DiGiulio, a visiting scholar at the Stanford School of Earth, Energy & Environmental Sciences in a released statement. "It's perfectly legal to inject stimulation fluids into underground drinking water resources. This may be causing widespread impacts on drinking water resources." The process of hydraulic fracturing, or fracking, involves injecting, at high pressure, water blended with chemicals such as benzene and xylene. This chemical mix is then used to blast apart the shale rock to release oil or gas. The method creates wastewater which is generally stored in pits near the operating well site. The findings came from a case study of Pavillion, a small Wyoming town with a population of 231. For the first time, research showed, the fracking operations near the town had polluted underground sources of drinking water, making it unsafe to use. The study found that chemicals in Pavillion’s water were also the same substances companies used in local fracking operations. Faulty cement barriers placed around the steel casing inside an oil or gas well created the potential for fracking chemicals to seep underground, and tests of groundwater showed dangerous concentrations of diesel-related compounds such as benzene. Fields have been in operation near the town since the 1960s, with more than 180 oil and gas wells, some now plugged and abandoned. “Decades of activities at Pavillion put people at risk. These are not best practices for most drillers,” said the co-author Rob Jackson, the Michelle and Kevin Douglas Provostial Professor at Stanford School of Earth, Energy & Environmental Sciences. Jackson and his colleagues have done various studies across the US and in the Pavillion Field. In 2008, the residents of Pavillion complained of a foul taste and odor in their drinking water and questioned whether it was related to physical ailments. The Environmental Protection Agency conducted testing, and in 2011, a preliminary report was issued linking shallow fracking to toxic compounds in aquifers. The EPA report was heavily criticized by the oil and gas industry and regulators, and the environmental watchdog agency never finalized its findings. Instead, it turned them over the state of Wyoming, which released a series of reports without firm conclusions. Wyoming has no plans to take further action on them. Meanwhile, the federal Agency for Toxic Substances and Disease Registry told area residents to avoid bathing, cooking or drinking with water from their taps. The Stanford researchers don’t think this problem is isolated to Pavillion, Wyoming. Jackson and DiGiulio recommend further investigation and regulations to limit shallow fracking and require deeper protective casings. Wyoming does not require the cementing of surface casings. Only two US states, Colorado and Texas, have such requirements. Jackie Stewart, state director for Energy in Depth-Ohio, a grassroots advocacy group supporting oil and gas development, told the Cleveland Plain Dealer that the findings of the Stanford study are not new and that it uses discredited data by the same researcher who wrote the EPA’s original report. The study Impact to Underground Sources of Drinking Water and Domestic Wells from Production Well Stimulation and Completion Practices in the Pavillion, Wyoming, Field was published this month in Environmental Science and Technology. The Stanford study was published the same week that the US Geological Survey concluded man-made earthquakes, often associated with hydraulic fracturing, have put 7 million people at risk. The central part of the US has seen a significant increase in earthquakes measuring 3.0 magnitude or greater on the Richter scale. Between 1973 and 2008, only about 24 earthquakes reached this level every year. Yet over the last six years, the number spiked sharply, up to an average of 318 a year. Last year alone saw 1,010 quakes.